A look at how we airbrushed one of our most popular Harley Tanks. The artwork featured in this video is only one side of the tank & we hope to eventually show you how the other side was completed. The videos cover, using white to build your artwork, airbrushing details, shading, texture and the use of Candy to blend in tones. We hope that you enjoy all 4 videos and remember to visit our website to check out more of our Artwork, Videos, Blog, Links & Tips and Tricks. 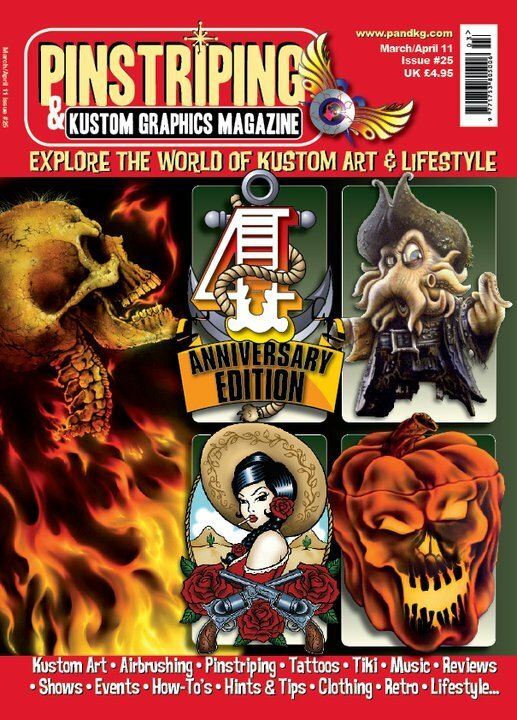 Airbrush Asylum features in the latest Pinstriping & Kustom Graphics Magazine, Issue #25. 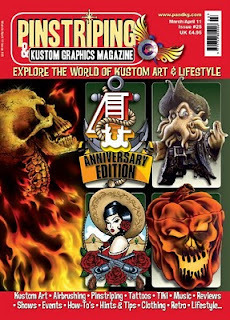 Go out and grab your copy, visit www.airbrushsuperstore.com.au or visit your local newsagency. Thanks to Lynda and the team @ P&KG for featuring us in this issue, for more information on back issues or subscription visit www.pandkg.com. Scale Mustang MERLIN, takes out 3 awards @ the Avalon Airshow. we are pleased to announce that Merlin, the scale mustang that we airbrushed in early 2008 won 3 concourse elegance awards @ the 90th Anniversary Avalon Airshow over the weekend. It was awarded - Best Composite, Best presented and Best Overall. Airbrush Asylum will be demonstrating at the H.O.G Victorian State Rally @ the Mornington Peninsula Racecourse. The event runs from March 11 - 14th, we will be demonstrating Friday 11th until Sunday 13th. Display Tanks from both Harley Heaven City and Dandenong stores will be on our stand to check out so if you are free that weekend, or you are already attending be sure to come and say hi and check out our artwork.